Don’t you wish you could finish your deck once, and then forget it? Well, you can, but it’s not going to last. Why? Sun, weather, proximity to the ground, and your 60 lb. Labrador all impact the look of your deck. 1. Do nothing and let your deck weather. It will take on a gray barn wood or driftwood look. I have a customer who is a world renowned furniture maker and artist who insists this is the best course of action. His deck is made from an exotic hard wood and doesn’t absorb deck stain anyway. Who am I to argue? 2. Clean your deck with dilute bleach (no more than 20% and some kind of soap). This will remove the unsightly mildew and algae that you want to get rid of. If you just do this every year or so, you are miles ahead of most people. 3. 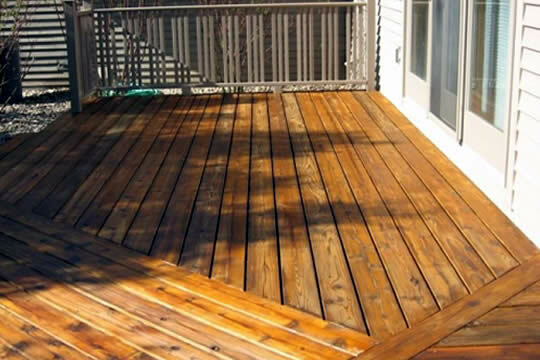 Clean your deck (as described above), then apply a stain. What stain? Lots of companies sell deck stain. They are not all equal. None last forever. We like 1. Rymar Extreme Weather and 2. Sikkens SRD. 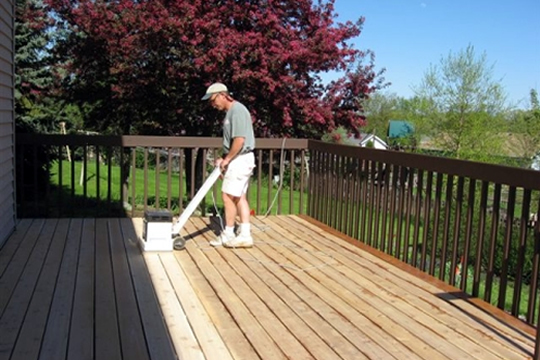 I was trained years ago by the Sikkens folks in the proper way to do deck refinishing. I will forever be grateful to them for that training. One of the biggest lessons I learned was how to use a power washer correctly. If you aren’t careful, you may gouge the deck wood and leave it furrowed and chewed up by the powerful jet of water from the power washer. We add a step when we do deck refinishing. We sand the deck boards with a floor sander made for that purpose. It is not so much to smooth out the wood (which it does), but to open up the grain, so the wood can drink in more stain. 4. Last resort. Paint your deck with deck paint. For some applications, this works well, but anything that forms a film (like paint) also has the potential to peel. If your deck is within a foot or so of the ground, this peeling issue is increased, because the moisture from underneath will be exerting its influence up through the deck boards. Sometimes, the best solution is to pull up the deck flooring and start over. We have experience in all of the things I’ve described and are happy to talk with you about your options.